Aims: angiography has limited value for identifying the causes of stent thrombosis (ST). We studied a large cohort of patients by optical coherence tomography (OCT) to explore ST characteristics and mechanisms. † Both authors contributed equally to the paper. Published on behalf of the European Society of Cardiology. All rights reserved. & The Author 2016. For permissions please email: journals.permissions@oup.com. A prospective multicentre registry was screened for patients with confirmed ST. Optical coherence tomography was performed after initial intervention to the culprit lesion ( in 69% of cases in a deferred procedure). Stent thrombosis was classified as acute (AST), sub-acute (SAST), late (LST), and very late (VLST). Optical coherence tomography records were analysed in a central core lab. The analysis included 120 subjects aged 61.7 [51.4 – 70.7]; 89% male. Very late ST was the clinical presentation in 75%, LST in 6%, SAST in 15%, and AST in 4% of patients. Bare metal stents (BMS) were used in 39%, drug-eluting stents (DES) in 59% and bioresorbable vascular scaffolds in 2% of the cases. Optical coherence tomography identified an underlying morphological abnormality in 97% of cases, including struts malapposition (34%), neoatherosclerotic lesions (22%), major stent underexpansion (11%), coronary evagination (8%), isolated uncovered struts (8%), edge-related disease progression (8%), and neointimal hyperplasia (4%). Ruptured neoatherosclerotic lesions were more frequent with BMS than with DES (36 vs. 14%, p= 0.005), whereas coronary evaginations were more frequentv with DES than with BMS (12 vs. 2%, p= 0.04). LST + VLST were mainly related to malapposition (31%) and neoathero-sclerosis (28%), while prominent mechanisms for AST + SAST were malapposition (48%) and underexpansion (26%). In patients with confirmed ST, OCT imaging identified an underlying morphological abnormality in 97% of cases. Coronary angiography is often of limited value in the identification of different mechanisms underlying ST and as a guide to adequate therapy. Recently, optical coherence tomography (OCT) has been noted as a potentially important imaging technique to assess mechanism of stent failure.10 Optical coherence tomography offers high resolution (10–15 μm) as well as in vivo coronary plaque morphology visualization. However, this method has not been used in large-scale multicentre prospective studies. 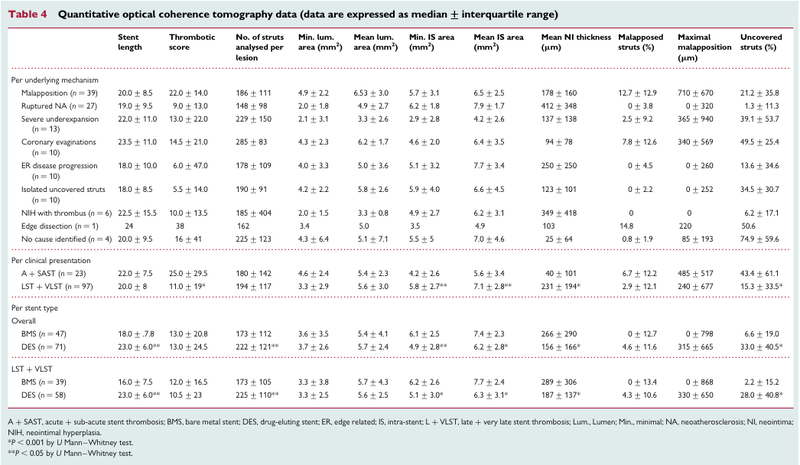 The PESTO (Morphological Parameters Explaining Stent Throm- bosis assessed by OCT) registry was set up to investigate the usefulness of OCT in assessing characteristics, mechanisms, and relative incidence of ST among a large cohort of patients. Patients’ baseline characteristics including medical history, clinical, biological, and angiographic parameters and recent modification of APT were prospectively collected in a predefined standardized case report form. As a part of the protocol, the PESTO local investigators reported and classified the ST suspected mechanism into three categories (‘unidentified’, ‘probably identified’, and ‘completely identified’) before (i.e. based on angiography data alone) and after OCT imaging. The study complied with the Declaration of Helsinki. The Gabriel Montpied University Hospital’s Ethics Committee approved the research protocol and informed consent was obtained from each patient before inclusion. Percutaneous coronary intervention was performed with a 6 Fr guiding catheter in all patients. The decision whether to use a thromboaspiration device and the options for ST management (culprit lesion deocclusion, balloon dilation alone, redo stenting, or medical treatment with anticoagulant therapy) were at the discretion of the local operators. The timing for OCT imaging (ad hoc or deferred analysis) was not pre-specified by the study protocol and was chosen by the local investigators according to their experience and patients’ clinical and angiography characteristics. Frequency domain-optical coherence tomography image analysis. Offline analysis was performed with proprietary software (Lightlab, Imaging Inc/St Jude Medical) after confirming calibration settings of the Z-offset. All images were recorded digitally, stored and read by three independent investigators (G.S., N.A., P.M./blinded to patients’ clinical, ST type and angiographic baseline characteristics) in a centralized core laboratory. Discordances around the leading cause of ST were resolved by consensus. The aetiologies of mechanical ST were classified as: major stent malapposition, severe stent underexpansion, in-stent ruptured neoatherosclerosis, coronary evaginations, isolated uncovered struts without associated abnormality, edge dissection, edge-related dis- ease progression, and intra-stent neointimal hyperplasia with adherent thrombus (Figure 1. Click to enlarge). The region of interest, including the stented as well as the surrounding normal coronary artery segments, was analysed systematically at 1 mm intervals. The outlines of stent and lumen were drawn for area measurements. In the presence of thrombus with low attenuation, the visible lumen contour could still be drawn behind the thrombus. In the presence of thrombus with high attenuation, the lumen contour was allowed to be extrapolated behind the thrombus when the lumen contour was visible in >3 quadrants. The stent area (SA) was measured by joining the middle points of the endoluminal signal rich strut surface of the stent. In case the stent was covered by thrombus with high signal attenuation, the SA was delineated only if at least one strut was clearly visible in every quadrant. Stent area and intra-stent lumen area (intra-stent area/ISA) were measured for each interval within the stent. Proximal and distal references lumen areas were also determined. The most ‘normal-appearing’ segments 5 mm proximal and distal to the lesion shoulders identified by OCT were used as references. A coronary evagination was defined as the presence of an outward bulge in the luminal vessel contour between apposed struts with a maximum depth of the bulge exceeding that of the actual strut thickness.17 Intimal vessels (or micro-channels) were defined as sharply delineated poor signal voids that could be followed in multiple contiguous frames. Neo-atheroma was defined as the combination of neointimal diffuse thickening with atherosclerotic plaque architectural features including lipid-laden intima, presence of a fibrous cap, neovessels and potential neointimal rupture.6 Neointimal rupture referred to a break in the fibrous cap connecting the lumen with the underlying lipid pool.18 Severe stent underexpansion was defined as intra-stent minimal area ≤70% of the average reference lumen area or ≤80% of the lumen area of the reference segment with the lowest lumen area.19 Edge-related disease progression was defined as the presence of a ruptured necrotic core plaque at the proximal edge of the stent in an incompletely covered lesion. The primary endpoint was the presence of an underlying mechanical abnormality (malapposition, severe underexpansion, ruptured neoathero- sclerotic lesion, coronary evagination, edge-related disease progression, neointimal hyperplasia with adherent thrombus, persistent edge dissection, or isolated uncovered struts without presence of any of the preceding abnormalities) on OCT analysis in patients with definite ST. The secondary endpoint was the incidence of major adverse cardiovascular events (including cardiovascular death, non-fatal stroke, non-fatal myocardial infarction, and the need for urgent target vessel revascularization) during 180 days after hospital discharge following ST. Follow-up was by clinic visits and/or by telephone contact. The statistical analysis was performed with SPSS 21.0 software (SPSS software, Chicago, IL, USA). Continuous variables are expressed as median and interquartile ranges and the normality of their distributions was assessed by the Kolmogorov – Smirnov test. The inter-observer (analyst #1 vs. analyst #2; analyst #1 vs. analyst #3; analyst #2 vs. analyst #3) and intra-observer reproducibility was evaluated by the kappa coefficient with calculation of the 95% confidence interval and tested vs. the null hypothesis. The differences between ST mechanical underlying abnormalities and OCT quantitative parameters were compared using x2 or Fisher exact tests (for categorical variables) and Student’s t or U Mann– Whitney tests (for continuous variables), as appropriate. Incidence of the secondary endpoint and of cardiovascular death during follow-up was evaluated according to the Kaplan – Meier method. A two-sided α level of 0.05 was used for all superiority testing. Table 1 : Click to enlarge. A total of 229 patients in 17 active centres were treated for ST during the inclusion period. A hundred and thirty-four patients were screened and of these, 123 provided informed consent (Figure 1). Three patients (2.4%) were excluded from the analysis because of inadequate OCT image quality (Figure 1). The baseline characteristics of the 120 patients included in the final analysis are given in Table 1. Most patients presented with VLST. The average time between index PCI and ST was 4.4 ± 0.4 years. Most devices were DES in 59% and BMS in 39%. Bioresorbable vascular scaffold (BVS) thrombosis was determined in two patients. First-generation DES were implicated in 34 subjects, second-generation DES in 35 subjects, and third-generation DES in two subjects. Patients with DES- related ST had a significantly higher incidence of hypertension, shorter time from index PCI to ST, longer and smaller devices and a more frequent left anterior descending artery location than patients with BMS. 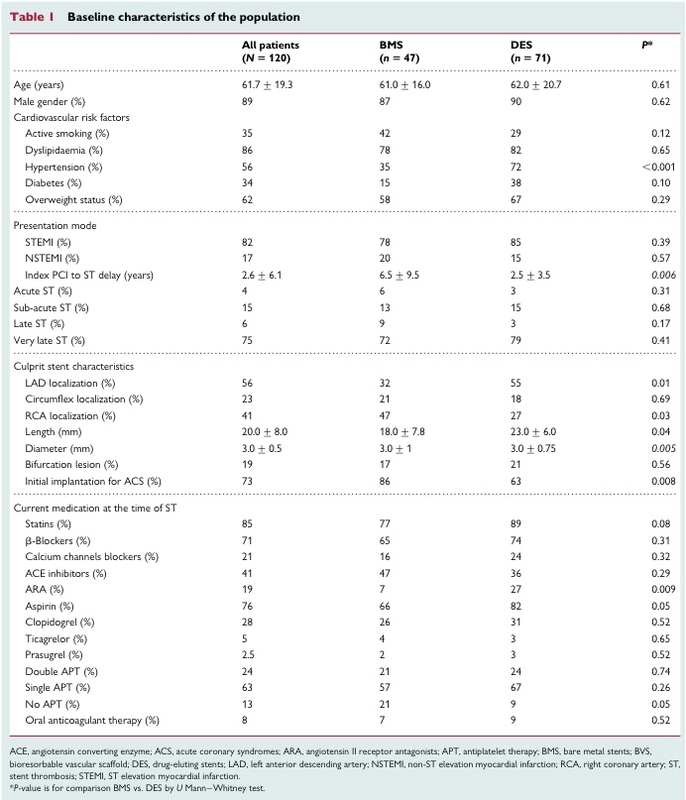 Single or dual APT was used by 87% of patients at the time of thrombosis (Table 1). A recent (< 15 days) modification of APT was reported in 22% of patients prior to ST. The initial antegrade TIMI flow was Grade 0 in 71%, Grade 1 in 10%, Grade 2 in 5%, and Grade 3 in 14% of patients. The method of initial intervention to the culprit lesion was manual thrombectomy in 101 patients (median number of passes: 2 [1–3]). Intravenous glycoprotein IIb–IIIa inhibitor therapy was administered to 89 subjects. Optical coherence tomography images were acquired during a deferred procedure in 85 patients (69%) (median delay between deocclusion to OCT: 4.0 days [2–7]). A total of 26 166 struts were analysed. Due to highly attenuating thrombus, 1235 struts in 120 patients could not be analysed. The intra- and inter-observer reproducibility for assessing the leading cause of ST was high for all reviewers (kappa coefficient ≥0.8, P,0.001). The primary endpoint (underlying morphological abnormality) was identified in 96.7% of patients. The remaining four cases (no mechanical cause identified) were related to APT interruption during the first month following stent implantation. A unique abnormality was found in 77.5% and multiple abnormalities in 22.5% of the cases. Physicians’ interpretations of OCT data correlated with those of the core lab in 84 of 120 cases (70%): these discrepancies suggest individual differences in OCT interpretation experience. Struts malapposition was the most frequently observed abnormality and was highly prevalent throughout all ST types (Table 2). Ruptured neoatherosclerosis was significantly more frequently observed in LST + VLST patients, whereas severe underexpansion was more common in subjects with AST + SAST (Figure 2). The causes and underlying mechanisms of ST varied according to stent type (Tables 3 and 4). Coronary evaginations were more frequently observed in DES than in BMS, whereas the incidence of rup- tured neoatherosclerosis lesions was higher in BMS than in DES. The delay between index PCI and ST was longer in the BMS neoatherosclerosis group than in the DES one (10.6 [8.8 – 14.8] vs. 5.3 [2.4 – 7.0] years, P=0.001). However, malapposition remained the main observed abnormality, regardless of the type of stent. The two cases of acute/ sub-acute BVS thrombosis were related to severe underexpansion. Before OCT, the mechanism of ST was considered as ‘completely identified’ in 12% of patients by local operators; this increased to 41% after OCT. Mechanisms were ‘probably identified’ in 40% before and 46% after OCT. The percentage of patients with ‘un- identified’ mechanisms was reduced from 48% without OCT to 13% with OCT. These differences were statistically significant (P< 0.001). Balloon angioplasty alone in 37%, repeat stenting in 31% and further additional thromboaspiration in 2% of the cases. The left ventricular ejection fraction at discharge was 55% [45–60]. Follow-up data were obtained in 122 (99%) patients. The rates of survival and freedom from MACE at 6 months were 97.4% [95% CI: 95.9 – 98.9%] and 91.5% [95% CI: 88.9 – 94.1%], respectively. During this period, a total of 12 adverse events were recorded (none dur- ing the in-hospital phase): three subjects died, eight underwent ur- gent target vessel revascularization (including three recurrent ST), and one subject experienced a transient ischaemic attack. The PESTO multicentre national registry was designed to evaluate the value of OCT techniques to improve the understanding of the clinical presentation and mechanisms underlying ST.20 The present work represents the largest attempt to date to explore the aetiology of this rare clinical event by OCT techniques. (ii) malapposition and neoatherosclerosis rupture were the main causes of LST and VLST and (iii) Malapposition and underexpansion were prominent mechanisms for AST and SAST. n contrast to other reports,6,22 we found that ruptured neoatherosclerosis, although common, was not the most frequent cause of VLST. Ruptured neoatherosclerosis was more frequent in BMS than in DES stents. It accounted for 36% of the BMS ST, which is in line with previous reports.26,27 Neoatherosclerosis formation is related to endothelial dysfunction and chronic inflammation around stent struts, potentially enhanced by the presence of coating polymers.28 Hence, DES may be more prone to neoatherosclerosis than BMS and may enhance lesion formation.28 That we nevertheless observed a higher incidence of ruptured neoatherosclerotic lesions in the BMS group is probably explained by the longer duration between index PCI to ST in these patients compared with the DES group. Stent thrombosis remains a therapeutic challenge for the clinician and there are no current international guidelines to guide treat- ment.20 The lack of consensus reflects a weak evidence base reflect- ing the lack of randomized controlled trials for what is a rare spontaneous event. The diagnostic challenges, including use (or not) of intra-vascular imaging and the heterogeneity of aetiologies, collectively contribute to our incomplete understanding of the causes and treatment of ST. Establishing an accurate diagnosis for the cause of ST is necessary in order to implement appropriate therapy. In our series, physicians reported that the ST origin could be identified with certainty by angiography in only 12% of cases whereas this percentage rose to 41% with OCT analysis, pointing out the very poor specificity of angiographic tools to assess ST aetiology. Balloon angioplasty and medical treatment alone were provided in 37 and 29% of the cases, respectively. Redo stent implantation was used in 31.1% of the cases, which is lower than in other published works. In a series of 7135 ST analysed by angiography, Armstrong and colleagues reported use of redo stenting in >50% of cases.29 The lower rate of stenting in patients managed with adjunctive OCT reflects on the added diagnostic value of this technique. For example, alternatives to routine stent implantation include balloon angioplasty alone for severe underexpansion or subsequent stent placement for neoatherosclerosis or edge-related disease progression. We observed a relatively low rate of adverse events in the PESTO population, which might be explained by a number of factors. First, our cohort includes a high percentage of patients with VLST, a condition that is associated with a better prognosis than early ST.29 Moreover, some patients presenting with pre-procedural cardiac arrest or cardiogenic shock were not screened or included in our final analysis, which probably decreased the number of adverse events. Furthermore, the high adoption of thrombus aspiration devices and GPIIb – IIIa inhibitors may also be relevant. Whether the reduced need for redo stenting from the OCT analysis contributed to these results cannot be determined in the present analysis and remains to be proven. Several limitations of this study deserve consideration. First, ST is a multifactorial process that potentially involves stent architecture abnormality and clinical factors, including degree of platelet inhibition under therapy or compliance with treatment. Although we evaluated declared compliance with APT, we do not have data regarding platelet function or genetic testing in our population, since the different tests were not performed routinely in the different centres. 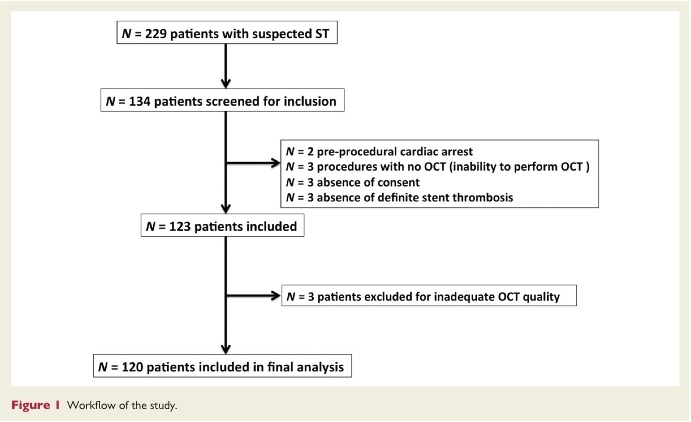 Moreover, a substantial number of patients presenting with ST were not screened for inclusion in the study because of an inadequate clinical presentation or impossibility to restore TIMI 3 flow without PCI before OCT images acquisition. Thus, our re- sults might be biased by patient selection and not reflect the true incidence of the different ST mechanisms in the general population (229 ST during this period in the 17 active centres). Moreover, our approach to OCT analysis was based on a core laboratory analysis and consensus between three expert operators. This approach might create some discrepancies in case of multiple underlying abnormalities (such as underexpansion and malapposed struts or evaginations and uncovered struts), yet there are currently no guidelines available to help resolve this issue. Furthermore, most of the OCT data in the present study were acquired during a deferred procedure following the initial deocclusion, according to the operators’ discretion. This fact might explain the low rate of OCT acquisitions that were rejected for inadequate quality by the core lab. However, our data might differ from series in which the intra-coronary imaging analysis was not deferred and thus make gen- eralization of our conclusions more difficult. Other limitations are the absence of an IVUS assessment at the time of the ST, the lack of thrombus aspirate analysis and the hetero- geneity of the types of stent used. Finally, the PESTO registry was designed to analyse the incidences of characteristics of ST in the French population. There was no control group of patients with non-thrombotic stent analysed with OCT that would have allowed us to specifically investigate predictive factors for ST, including the role of uncovered struts. In conclusion, in this prospective registry in France, most ST events occurred ≥1 year after the initial procedure. Optical coherence tomography identified an underlying morphological abnormality in 97% of cases. Although the underlying mechanisms were various, struts malapposition, ruptured neoatherosclerosis, and severe underexpansion were the most frequently observed causes. A.N., M.A. performed statistical analysis. A.N., S.G. handled funding and supervision. S.G., A.N., M.P., C.X., M.N., M.L., V.G., C.G., B.P., T.C., R.G., R.G., L.S., T.E., D.R., D.O., L.T., B.L. acquired the data. S.G., A.N., M.P. conceived and designed the research. S.G., A.N. drafted the manuscript. S.G., A.N. made critical revision of the manuscript for key intellectual content. This work received unrestricted financial support from Saint-Jude Medical and Medtronic. Conflict of interest: G.S., P.M.: consulting for St Jude Medical and Terumo; N.A., C.C. consulting for St Jude Medical. 1. Raber L, Magro M, Stefanini GG, Kalesan B, van Domburg RT, Onuma Y, Wenaweser P, Daemen J, Meier B, Ju ̈ni P, Serruys PW, Windecker S. Very late coonary stent thrombosis of a newer-generation everolimus-eluting stent compared with early-generation drug-eluting stents: a prospective cohort study. Circulation 2012;125:1110 – 1121. 2. van Werkum JW, Heestermans AA, Zomer AC, Kelder JC, Suttorp M-J, Rensing BJ, Koolen JJ, Brueren BRG, Dambrink J-HE, Hautvast RW, Verheugt FW, ten Berg JM. Predictors of coronary stent thrombosis: the Dutch stent thrombosis registry. J Am Coll Cardiol 2009;53:1399–1409. 3. Kimura T, Morimoto T, Kozuma K, Honda Y, Kume T, Aizawa T, Mitsudo K, Miyazaki S, Yamaguchi T, Hiyoshi E, Nishimura E, Isshiki T, RESTART Investigators. Comparisons of baseline demographics, clinical presentation, and long-term out- come among patients with early, late, and very late stent thrombosis of sirolimus-eluting stents: observations from the registry of stent thrombosis for re- view and reevaluation (RESTART). Circulation 2010;122:52–61. 4. Prati F, Kodama T, Romagnoli E, Gatto L, Di Vito L, Ramazzotti V, Chisari A, Marco V, Cremonesi A, Parodi G, Albertucci M, Alfonso F. Suboptimal stent de- ployment is associated with subacute stent thrombosis: optical coherence tomography insights from a multicenter matched study. From the CLI Foundation investigators: the CLI-THRO study. Am Heart J 2015;169:249–256. 5. Nakazawa G, Vorpahl M, Finn AV, Narula J, Virmani R. One step forward and two steps back with drug-eluting-stents: from preventing restenosis to causing late thrombosis and nouveau atherosclerosis. JACC Cardiovasc Imaging 2009;2:625 – 628. 6. Amabile N, Souteyrand G, Ghostine S, Combaret N, Slama MS, Barber- Chamoux N, Motreff P, Caussin C. Very late stent thrombosis related to incom- plete neointimal coverage or neoatherosclerotic plaque rupture identified by op- tical coherence tomography imaging. Eur Heart J Cardiovasc Imaging 2014;15:24 – 31. 7. GuagliumiG,SirbuV,MusumeciG,GerberR,Biondi-ZoccaiG,IkejimaH,LadichE, Lortkipanidze N, Matiashvili A, Valsecchi O, Virmani R, Stone GW. Examination of the in vivo mechanisms of late drug-eluting stent thrombosis: findings from optical coherence tomography and intravascular ultrasound imaging. JACC Cardiovasc Interv2012;5:12 – 20. 8. Hassan AK, Bergheanu SC, Stijnen T, van der Hoeven BL, Snoep JD, Plevier JW,Schalij MJ, Wouter Jukema J. Late stent malapposition risk is higher after drug-eluting stent compared with bare-metal stent implantation and associates with late stent thrombosis. Eur Heart J 2010;31:1172–1180. 9. Parodi G, La Manna A, Di Vito L, Valgimigli M, Fineschi M, Bellandi B, Niccoli G, Giusti B, Valenti R, Cremonesi A, Biondi-Zoccai G, Prati F. Stent-related defects in patients presenting with stent thrombosis: differences at optical coherence tom- ography between subacute and late/very late thrombosis in the mechanism of stent thrombosis (MOST) study. EuroIntervention 2013;9:936–944. 10. Authors/TaskForceMembers,WindeckerS,KolhP,AlfonsoF,ColletJP,CremerJ, Falk V, Filippatos G, Hamm C, Head SJ, Juni P, Kappetein AP, Kastrati A, Knuuti J, Landmesser U, Laufer G, Neumann FJ, Richter DJ, Schauerte P, Sousa Uva M, Stefanini GG, Taggart DP, Torracca L, Valgimigli M, Wijns W, Witkowski A. 2014 ESC/EACTS Guidelines on myocardial revascularization: The Task Force on Myo- cardial Revascularization of the European Society of Cardiology (ESC) and the European Association for Cardio-Thoracic Surgery (EACTS) Developed with the special contribution of the European Association of Percutaneous Cardiovas- cular Interventions (EAPCI). Eur Heart J 2014;35:2541–2619. 11. CutlipDE,WindeckerS,MehranR,BoamA,CohenDJ,vanEsG-A,GabrielStegP, Morel M-al, Mauri L, Vranckx P, McFadden E, Lansky A, Hamon M, Krucoff MW, Serruys PW, Academic Research Consortium. Clinical end points in coronary stent trials. Circulation 2007;115:2344–2351. 12. Task Force on the Management of STseamiotESoC, Steg PG, James SK, Atar D, Badano LP, Blomstrom-Lundqvist C, Borger MA, Di Mario C, Dickstein K, Ducrocq G, Fernandez-Aviles F, Gershlick AH, Giannuzzi P, Halvorsen S, Huber K, Juni P, Kastrati A, Knuuti J, Lenzen MJ, Mahaffey KW, Valgimigli M, van’t Hof A, Widimsky P, Zahger D. ESC Guidelines for the management of acute myo- cardial infarction in patients presenting with ST-segment elevation. Eur Heart J 2012;33:2569 – 2619. 13. 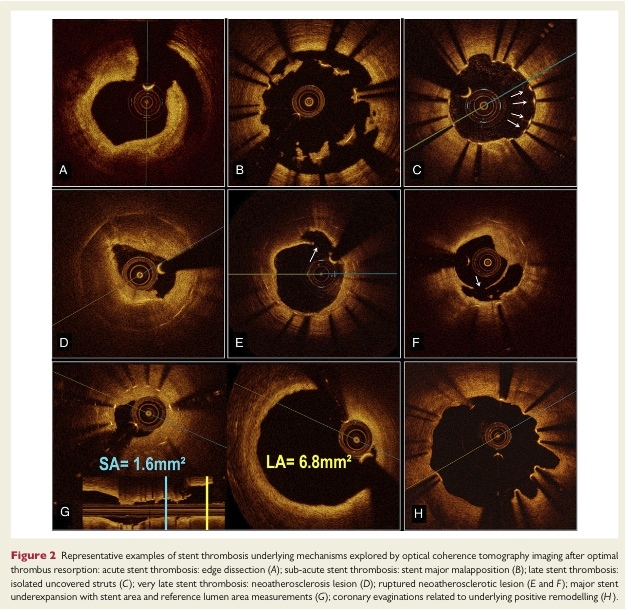 Souteyrand G, Amabile N, Combaret N, Hammas S, Prati F, Berry C, Pereira B, Lusson JR, Caussin C, Motreff P. Invasive management without stents in selected acute coronary syndrome patients with a large thrombus burden: a prospective study of optical coherence tomography guided treatment decisions. EuroInterven- tion 2015;11:319–324. 14. Prati F, Regar E, Mintz GS, Arbustini E, Di Mario C, Jang IK, Akasaka T, Costa M, Guagliumi G, Grube E, Ozaki Y, Pinto F, Serruys PW. Expert review document on methodology, terminology, and clinical applications of optical coherence tom- ography: physical principles, methodology of image acquisition, and clinical application for assessment of coronary arteries and atherosclerosis. Eur Heart J 2010;31: 401 – 415. 15. Prati F, Guagliumi G, Mintz GS, Costa M, Regar E, Akasaka T, Barlis P, Tearney GJ, Jang I-K, Arbustini E, Bezerra HG, Ozaki Y, Bruining N, Dudek D, Radu M, Erglis A, Motreff P, Alfonso F, Toutouzas K, Gonzalo N, Tamburino C, Adriaenssens T, Pinto F, Serruys PWJ, Di Mario C, Expert’s OCT Review Document. Expert review document part 2: methodology, terminology and clinical applications of optical coherence tomography for the assessment of interventional procedures. Eur Heart J 2012;33:2513 – 2520. 16. Prati F, Capodanno D, Pawlowski T, Ramazzotti V, Albertucci M, La Manna A, Di Salvo M, Gil RJ, Tamburino C. Local delivery versus intracoronary infusion of abciximab in patients with acute coronary syndromes. JACC Cardiovasc Interv 2010;3: 928 – 934. 17. Radu MD, Raber L, Kalesan B, Muramatsu T, Kelbaek H, Heo J, Jorgensen E, Helqvist S, Farooq V, Brugaletta S, Garcia-Garcia HM, Juni P, Saunamaki K, Windecker S, Serruys PW. Coronary evaginations are associated with positive ves- sel remodelling and are nearly absent following implantation of newer-generation drug-eluting stents: an optical coherence tomography and intravascular ultrasound study. Eur Heart J 2014;35:795–807. 18. Kang SJ, Mintz GS, Akasaka T, Park DW, Lee JY, Kim WJ, Lee SW, Kim YH, Whan Lee C, Park SW, Park SJ. Optical coherence tomographic analysis of in-stent neoatherosclerosis after drug-eluting stent implantation. Circulation 2011;123: 2954 – 2963. 19. Meneveau N, Ecarnot F, Souteyrand G, Motreff P, Caussin C, Van Belle E, Ohlmann P, Morel O, Grentzinger A, Angioi M, Chopard R, Schiele F. Does optical coherence tomography optimize results of stenting? Rationale and study design. Am Heart J 2014;168:175–81 e1–2. 20. Alfonso F, Sandoval J. New insights on stent thrombosis: in praise of large nation- wide registries for rare cardiovascular events. JACC Cardiovasc Interv 2012;5: 141 – 144. 21. Amabile N, Hammas S, Fradi S, Souteyrand G, Veugeois A, Belle L, Motreff P, Caussin C. Intra-coronary thrombus evolution during acute coronary syndrome: regression assessment by serial optical coherence tomography analyses. Eur Heart J Cardiovasc Imaging 2015;16:433–440. 22. Kang S-J, Lee CW, Song H, Ahn J-M, Kim W-J, Lee J-Y, Park D-W, Lee S-W, Kim Y-H, Mintz GS, Park S-W, Park S-J. OCT analysis in patients with very late stent thrombosis. JACC Cardiovasc Imaging 2013;6:695–703. 23. Gonzalo N, Barlis P, Serruys PW, Garcia-Garcia HM, Onuma Y, Ligthart J, Regar E. Incomplete stent apposition and delayed tissue coverage are more frequent in drug-eluting stents implanted during primary percutaneous coronary intervention for ST-segment elevation myocardial infarction than in drug-eluting stents im- planted for stable/unstable angina: insights from optical coherence tomography. JACC Cardiovasc Interv 2009;2:445–452. 24. ShimamuraK,KuboT,AkasakaT,KozumaK,KimuraK,KawamuraM,SumiyoshiT, Ino Y, Yoshiyama M, Sonoda S, Igarashi K, Miyazawa A, Uzui H, Sakanoue Y, Shinke T, Morino Y, Tanabe K, Kadota K, Kimura T. Outcomes of everolimus-eluting stent incomplete stent apposition: a serial optical coherence tomography analysis. Eur Heart J Cardiovasc Imaging 2015;16:23 – 28. 25. Inaba S, Mintz GS, Farhat NZ, Fajadet J, Dudek D, Marzocchi A, Templin B, Weisz G, Xu K, de Bruyne B, Serruys PW, Stone GW, Maehara A. Impact of positive and negative lesion site remodeling on clinical outcomes: insights from PROSPECT. JACC Cardiovasc Imaging 2014;7:70–78. 26.HouJ,QiH,ZhangM,MaL,LiuH,HanZ,MengL,YangS,ZhangS,YuB,JangI-K. Development of lipid-rich plaque inside bare metal stent: possible mechanism of late stent thrombosis? An optical coherence tomography study. Heart 2010;96: 1187 – 1190. 27. Yamaji K, Inoue K, Nakahashi T, Noguchi M, Domei T, Hyodo M, Soga Y, Shirai S, Ando K, Kondo K, Sakai K, Iwabuchi M, Yokoi H, Nosaka H, Nobuyoshi M, Kimura T. Bare metal stent thrombosis and in-stent neoatherosclerosis. Circ Cardi- ovasc Interv 2012;5:47–54. 28. Otsuka F, Byrne RA, Yahagi K, Mori H, Ladich E, Fowler DR, Kutys R, Xhepa E, Kastrati A, Virmani R, Joner M. Neoatherosclerosis: overview of histopathologic findings and implications for intravascular imaging assessment. Eur Heart J 2015; 36:2147 – 2159. 29. Armstrong EJ, Feldman DN, Wang TY, Kaltenbach LA, Yeo K-K, Wong SC, Spertus J, Shaw RE, Minutello RM, Moussa I, Ho KKL, Rogers JH, Shunk KA. Clinical presentation, management, and outcomes of angiographically documented early, late, and very late stent thrombosis. JACC Cardiovasc Interv 2012;5:131–140.